During one occasion, Dorothy Eady, aka Omm Seti , said that in her past life, when she was called Bentreshyt, the Temple of Seti was surrounded by trees and had a beautiful garden. At that time, gardens were nowhere to be seen. But then, one day, archaeologists excavated something unprecedented, a garden. But this wasn’t an ordinary garden somewhere in Abydos. The garden was placed in the same location, right there where Dorothy said the garden would be. One of the most fascinating stories of reincarnation is that of Dorothy Eady; a woman said to have been a Pharaoh’s lover and priestess in her past life, thousands of years ago. Today, many young children seem to tell the story of their ‘past lives’ and while many parents look past this putting it down as children’s imagination, there are some stories which cannot be easily dismissed. This is the case of Dorothy Eady. Dorothy was born in 1904 in a suburb near London, UK. When she was just around three years old, she fell and injured her head drastically. She was declared dead by doctors who couldn’t help. However miraculously, the young child didn’t die but woke, and at that moment, her entire life changed. The young girl had changed forever; her actions were not those of a normal three-year-old, and her parents knew it. In numerous occasions, young Dorothy demanded to be taken home, to Egypt, thousands of miles from the suburbs of London. She was convinced that she could remember her past life and that she was born, in a different life, across the sea in the land of the Pharaohs: Egypt. Not only did Dorothy remember who she was, but she recounted incredible details from a time when she was an Egyptian priestess. In her previous life e, Dorothy Eady claimed she was a priestess of Isis at the Temple of Abydos. According to her accounts, she was a woman called Bentreshyt. She lived and served at the court of Pharaoh Seti. Young Dorothy drove her parents crazy, and her radical change in behavior could not be explained so easily. On one occasion, while looking at old images of the temple of Seti I, Dorothy stated that it was there where her home was. She could not understand why there were no trees and gardens around the temple, but she was firmly convinced that it was there where she lived, thousands of years ago. On one occasion, her parents took young Dorothy to visit the British Museum in London. Upon entering the Museum, Dorothy’s behavior became even stranger as she ran towards the mummies of ancient Egypt with statues of all Ancient Egyptian Gods and Goddesses, which young Dorothy began kissing uncontrollably. Soon after, the child began screaming in a voice that sounded unfamiliar and extremely ancient, leaving her parents shocked. At the age of fifteen years, Dorothy had already started to study the history of Egypt, and it is then, when the young woman had her first lucid dream with the mummy of Pharaoh Seti I. This magical encounter brought back numerous memories of her past life, and it was then when she began completing the puzzle of her reincarnation. The gradual memories and dreams, in addition to the knowledge about ancient Egypt she was picking up eventually led Dorothy to leave the Christian religion and embrace the old polytheistic religion of ancient Egypt. Dorothy had the incredible ability to learn Egyptian symbols with ease. She began learning Egyptian hieroglyphs at the British Museum, and she astounded her teachers with her ability. Eventually, Dorothy explained that it was easy for here since she wasn’t learning a new language, but was only remembering a language she had forgotten. In 1932, Dorothy moved to Egypt where she lived with her husband, Eman Abdel Meguid, an Egyptian student she had met in England. Upon arriving in Egypt, Dorothy kissed the ground knowing that she was finally at home, saying that she came to Egypt to stay. Eventually, Dorothy became pregnant giving birth to a son which she named –not surprisingly- Sety. This is why Dorothy Eady was called Omm Sety, which translated means mother of Seti. For years, Dorothy tried very hard to remember her past life, putting together a puzzle, thousands of years old: The reincarnation of Bentreshyt. Dorothy discovered that in her past life she was a young woman named Bentreshyt, who was raised at the Temple of Seti in Abydos from the age of three. Dorothy reported having numerous visitations of a spirit called Hor-Ra, who helped her decipher the secrets of her past life. She was left at the temple by her father; a soldier who could not take care of the child after her mother, a modest fruit seller, died. During her life at the temple of Abydos, where she became a priestess and ‘consecrated virgin’ eventually, she met the living God Pharaoh Seti I, and the two eventually fell in love. As the Pharaoh’s lover, young Bentreshyt ended up pregnant but unfortunately, the fate of such a relationship did not have a happy ending. Soon after she found out she was pregnant, a high priest of the temple told Bentreshyt that the child she was expecting would represent a great offense against the goddess Isis and could cause many problems to the Pharaoh, so she decided, or was instigated to commit suicide. Over the year, Dorothy helped archaeologists with their research, proving that somehow, her fascinating story was real. Dorothy moved to Abydos in 1956, where she was known as Omm Sety, and it was there where she faced numerous challenged that would test her stories and knowledge. If Dorothy did in fat live in Egypt thousands of years ago, then she surely must have remembered and known important details. During one occasion, when Dorothy traveled to the Temple of Seti the chief inspector from the Antiquities Department who knew the story of Omm Seti decided to test her ability and knowledge in order to find out, whether or not her story was true. The chief of the Antiquities Department was eager to see whether or not she was lying. She was asked to stand near a particular wall painting in nearly complete darkness. There, the chief of the antiquities department told her to identify them according to the memories of her past life. The answers were fascinating. Interestingly, the paintings and markings Dorothy identified had never been seen by anyone in the world. They have not published anywhere in Egypt so no one could have seen them. But not only did she know all of the answers, she told the chief of the Antiquities Department of things that they had not even discovered yet. 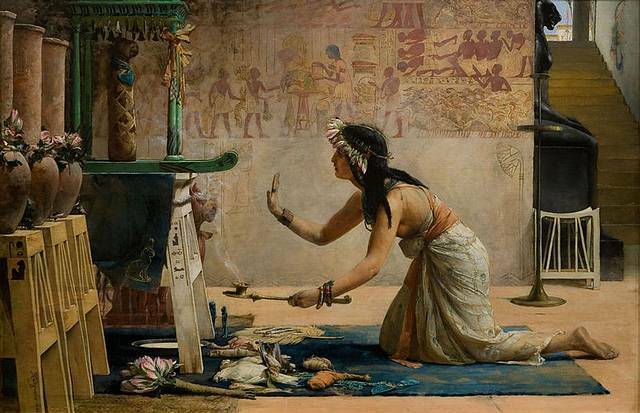 Her story became more famous, and she helped with excavations and research in ancient Egypt. She translated extremely difficult pieces of art that even the greatest archaeologists couldn’t. Her knowledge of the ancient Egyptian language helped archaeologists who were excavating at Abydos. Interestingly, according to Eady, the tomb of Queen Nefertiti is located at the Valley of the Kings. Every morning, Dorothy would go to the temple to pray. During the birthdays of Isis and Osiris, she observed food ceremonies, bringing beer, wine, and bread, just as it was done thousands of years ago. During one occasion, Dorothy said that in her past life, when she was Bentreshyt, the Temple of Seti was surrounded by trees and had a beautiful garden. At that time, gardens were nowhere to be seen. But then, one day, archaeologists excavated something unprecedented, a garden. But this wasn’t an ordinary garden somewhere in Abydos. The garden was placed in the same location, right there where Dorothy said the garden would be. This incredible knowledge and her fascinating abilities are enough proof for many people that reincarnation is real. Skeptics will always remain cautious when it comes to things like this. However, many people in Egypt firmly believe that Omm Sety, Dorothy or Bentreshyt, did reincarnate and lived during the reign of Pharaoh Seti I thousands of years ago. Dorothy died on the 21st of April 1981. But she made sure that before her death, locals would remember her, and they did, as a passionate lady with a never-before-seen knowledge of Abydos, ancient Egypt, and ancient Egyptian language. Whether skeptics believed in her or not is another story, the locals surely did. VIDEO FOOTAGE OF MAN PASSING BY A MIRROR WITHOUT REFLECTION .. Hoax ?